Networking is something that many of us dread and try to avoid at all costs. But no longer the sole remit of sales people, it has become a vital business skill for us all. Expected to negotiate effectively through our careers, social lives and online presence, networking 24/7 has become a real challenge. Many experts believe that you need to be super confident or a brilliant presenter in order to network to the best of your ability but networking has changed. Let Stefan Thomas show you how to take a fresh look at Networking 2.0 and teach you how networking is no longer just something we do with other people and it's no longer an activity, it's a new way of thinking and acting. Instant Networking will show you how to build networking into all that you do, whether you're self-employed, fresh out of education and ready to take on the world or just ready to make your presence known. With 20 years previous experience as an estate agent (realtor) under his belt, Stefan Thomas (UK), ditched his red braces and followed his passion for people. From being a nervous networker himself, Stefan went on to become the Network Director for 4Networking Limited, the UK’s fastest growing joined up network organization. He was personally responsible for the 5000 networking events they run every year and helped 4Networking grow into the organization they are today, with a culture of education and personal development for all of their members. Now a speaker, author and consultant (www.noredbraces.com)Stefan specializes in helping people find a way to make business networking work for them and is passionate about helping people network effectively and create big opportunities from small conversations. 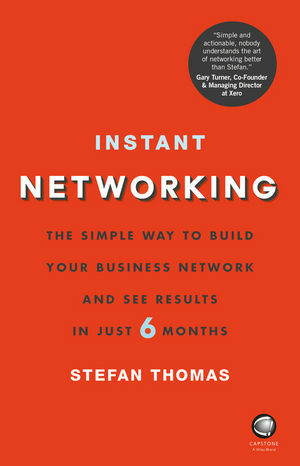 Stefan is the author of Business Networking For Dummies. (Apr 2014).